AR-FÔR, or the “Country of Fôr," more commonly called Darfur, by fusing the two words in a similar fashion to that in which the French say "Angleterre," instead of "Pays des Anglais," is the region which stretches west of Kordofân on the route to the river Niger. Dar-Fôr does not entirely belong to the Nile basin. Its western slope, which has as yet been explored but by few travellers, appears to lose its waters in depressions with no outlet; but if the rainfall were sufficiently abundant the wadies of this region, changed into permanent watercourses, would ultimately reach Lake Tsad. The streams draining in the direction of the Nile also run dry in the plains, except in the season of the kharif, when the streamlets rising in the southern part of Mount Marrah fall into the Bahr-el-Arab. Wady-Melek, or Wed-el-Mek, that is to say the "Royal Valley," also called Wady-Mas-Sûl, which runs to the north-east of Dar-Fôr towards the great bend of the Nile, is also flooded with water during rainy years, possibly for ten or fifteen days together; but it never reaches the Nile, its mouth being blocked by shifting sands. The enormous fluvial bed, nearly always dry, might roll down a volume equal to that of the Rhône or the Rhine. Its sandstone or limestone cliffs, here and there interrupted by lava streams, are from 3 to 30 miles apart, whilst the hollows are filled with trees, which form a continuous line like a band of verdure in the midst of the desert. The eastern half of Dar-Fôr, belonging to the Nile basin, is the most important part from a political point of view, probably on account of the commercial attraction exercised by the Nilotic towns, and because, in the neighbourhood of the mountains, where water is more plentiful, the people naturally settle down in large numbers. In this respect Dar-Fôr is a second Kordofân, but on a much larger scale. Around a central district dotted with settled villages stretches the zone of the wilderness and grassy savannahs. A country of this description can scarcely have any fixed boundaries; here camps, wells, clumps of acacias or brushwood, and bleached bones are the signs by which the traveller knows he is crossing from one district into another. As far as can be judged, without attempting an at present impossible approximation, the area of Dar-Fôr and its dependencies may be estimated at 200,000 square miles. This extent of country is bounded to the north by the desert, east by Kordofân, south by the Bahr-el-Arab, and west by Wadaï, whilst its total populations, according to Nachtigal, amounts to at least 4,000,000. Mason, however, who has also visited this country, thinks that the population does not exceed one million and a half. Dar-Fôr, whose capital is more than 360 miles from the Ni1e in a straight line, is too far removed from this great commercial route to have been frequently visited. It was not known even at the end of the last century except by name, and it was then that it entered for the first time into the history of geography, thanks to the voyage of the Englishman, Brown, who remained in the country three years, although rather as a captive than a free man. An Arab, Mohammed el Tunsy, or the "Tunisian," dwelt still longer in Dar-Fôr, and wrote a very interesting work upon it, which has since been translated into French. It is still the only book which contains the fullest and most valuable account of the history, manners, and customs of the Dar-Fôrians. The Frenchman Cuny in 1858 presented himself at the court of El-Fasher, but he mysteriously died there a few days after his arrival, and not even his diary from El-Obeïd to El-Fasher has been preserved. The sovereign of Dar-Fôr had doubtless wished to act up to the name bestowed on his country, "the mouse trap of Infidels," who, it is said, "can easily come in, but never get out again." It was to Nachtigal, the third European visitor, that fell the honour of describing, for the first time during this century, the interior of a country hitherto so little known. This explorer was still in Dar-Fôr when the slave-dealer Zibehr commenced its conquest, which was soon afterwards achieved in the name of the Egyptian Government. The country was opened to travellers, and the European staff officers were able to draw up a map of it; but the Egyptian occupation has not even lasted ten years. The governor nominated by the Khedive is a prisoner of the insurgent Mussulmans, and the frontier of Dar-Fôr is again forbidden to explorers for a time. More truthfully than to most other countries the expression "backbone" may be applied to the mountain system of Dar-Fôr. Here almost more than elsewhere the whole living organism—streams, plants, animals, man himself and his history— are attached to the main ranges as to the bones of a skeleton. Without the mountains of Marrah there would be no Dar-Fôr. This chain of lavas and granites, whose general shape is that of a crescent, commences north of the fourteenth degree of latitude, and after running southwards for a distance of about 120 miles, sweeps round to the west. At the point where Nachtigal crossed it, towards its northern extremity, it bears the name of Kerakeri, which signifies "rubbish," or "rabbit-burrow,” which term has been procured for it by the thousands of crumbling blocks covering its slopes. in the northern part of the chain, rises to a height of 4,800 feet. According to the culminating point of the Marrah range attains an altitude of 6,100 feet, or about 2,660 feet above the low-lying plains of Dar-Fôr. The rocks of Marrah contain numerous caverns, several of which formerly served as prisons, some for the sons of princes, others for the viziers. To the north and south are secondary chains and isolated masses like those of Kordofân. Such are the superb Gurger Mountains to the north-west, and the Jebel-Si, standing quite alone in the plain and terminated by an enormous crag in shape of a throne. A village is perched round these escarpments, protected by a circular enclosure. In the more remote regions of central Dar-Fôr are also a few isolated uplands. The confines of Wadaï, towards the north-west angle of Dar-Fôr, are indicated from afar by the Jebel-Abû-Ahraz, or the "Mountain of the Father of the Acacias." A second height, better known, as it commands the travail route from Kobeh to Siut to the west, develops its peaks, such as the Jebel-Dor and the Jebel-Anka, in a line with the northern continuation of the main axis of the Marrah range. 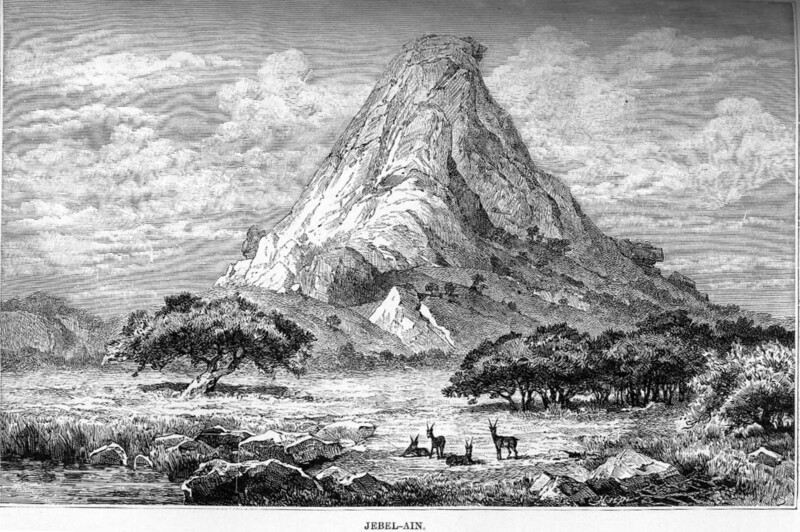 To the north-east of Dar-Fôr, the Jebel-Medob lifts its sandstone walls and granite cupolas, here and there broken by lava streams, to a height of nearly 4,000 feet. Beyond this point extends the plateau of the Jebel-Aïn, skirted by the Wady-Melek. To the east the Jebel-el-Hillet, which is skirted by the route from El-Fasher to El-Obeïd, and to the south, in the hydrographic basin of the Bahr-el-Arab, are still several other isolated uplands, connected by no intermediate ridges with the Marrah highlands. The Jebel-Hadid, one of these groups of hills, is very rich in iron ores. Some 30 miles to the south-west of the Jebel-Dango, another mountain mass rising above a plain, are the copper-mines of Hofrah, celebrated throughout the whole of central Africa. The mineral vein which is now being worked lies on the right bank of the Bahr-el-Fertit, an affluent of the Bahr-el-Arab. An excavation, 500 feet long by 50 feet broad, with a mean depth of 10 feet, has been dug out by the miners, and shafts, now abandoned, have been sunk in all directions within a radius of 1,660 feet from the pit. It was mainly with a view to obtain these copper-mines that the Khedive caused Dar-Fôr to be occupied. Few other regions have been the cause of more wars between the African populations than these now valueless mineral beds. The rainfall and the waters of the wadies are regulated by the atmospheric currents, as in Kordofân; however, it would appear that the higher mean elevation and the greater extent of the Dar-Fôr highlands cause more of the rain-bearing winds to be arrested, thus securing a more copious rainfall for this region. Near the centre of this mountainous district, in a closed amphitheatre, lies a lake which has never yet been visited by European travellers. The rains are more abundant in the western region of Dar-Fôr; and as concave side of the crescent-shaped Marrah range faces westwards, the water courses of this watershed all converge on the main branch, the Wady-Azum, a relatively copious stream, although its bed is dry for a portion of the year. On the convex slope of the Marrah Mountains the running waters, diverging east and southwards, become lost in the desert, and hence are unable to unite their sandy beds in one common hydrographic system. On the southern slope alone, where the rains fall more frequently, the rivers have a longer course and constitute veritable fluvial basins. Thus, during the rainy season, the Wady-Amor and the Wady-el-Kô combine to fill a rahad or lake of considerable size, at which the Rizegat Baggâras water their cattle. Farther westwards, other wadies send down during the kharif a sufficient volume to cause the floods to spread out into vast temporary lakes, in which the dunes and argilaceous hills appear like islands. Here and there are even some lakes in the steppe, such as Lake Taïmo, in which water is found at the height of the dry season. Nevertheless Wilson and Felkin state that at Shekka, during the dry months, the people use the juice of the water-melon instead of water for household purposes, and that the cattle have scarcely any other liquid to drink. The upper Bahr-el-Arab, which receives the surplus of all the wadies of southern Dar-Fôr, is flooded throughout the year, and in the Bahr-el-Fertit, a northern affluent of the Bahr-el-Arab, water is always to be obtained at a depth of a few inches below the surface. The fish take refuge in the deep pools excavated by the current at the base of the rocks, and the river is said to be navigable during the kharif. The southern region, which is often flooded, is the least healthy. Whilst that of the north, being drier, and at the same time lying at a higher elevation, is generally salubrious. 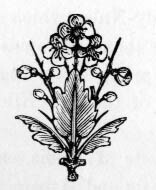 The flora of Dar-Fôr is identical with that of Kordofân, at least in the region which is not watered by the affluents of the Bahr-el-Arab. The plants and wild beasts, as well as the cultivated species of the domestic animals, differ in no respect in the two regions. The same living forms and products are to be found in the corresponding climatic zones; however, the western region of Dar-Fôr, where water is more abundant, and the layer of vegetable humus thicker, is by far the richest in variety of species. In both countries, woods and groves are found only on the banks of the wadies, the intermediary tracts presenting the appearance of a steppe or even a desert. Acacias, tamarisks and sycamores are the commonest varieties of trees. The baobab, which in Dar-Fôr is also used as a reservoir during the dry season, finds its northern limit towards the middle of the country. In the mountains the branching euphorbias recall the flora of the Abyssinian plateau; here are also found cedars, orange-trees, citrons and pomegranates, which reminded the Italian Messedaglia of his country. Before the war, the fruit of the tamarisk, kneaded into small cakes, was exported to Nubia and Egypt. One of the most valuable trees is the higlik (balcinites Ægyptiaca), whose fruit, neglected in the zeriba region, is used as an aliment by the Forians. The fruit, made into a paste with pounded roots, is also used as soap, whilst the young leaves and shoots make an excellent seasoning. The ashes yield a kind of pickle, also employed in their diet, and its wood burns without giving out smoke. Thus the higlik is to the Forians what the date is to the Egyptians. The palm is rarely seen, although the western districts possess the wine palm (raphia vinifera). Dar-Fôr and Kordofân are comprised between two zones of vegetation, to the north that of the date, and to the south that of the deleb palm. The southern part of Dar-Fôr also forms the northern boundary of the forest zone, which, however, thanks to the rains, encroaches towards the north on the basin of the Bahr-el-Arab. Here stretch the dense forests of El-Hallah, frequented by the elephant, rhinoceros, giraffe, and buffalo, which are chased by the Baggâra hunters of the Kambanieh or Habanieh tribe. The ostrich, and various species antelope, are also found in large numbers in the surrounding steppes; but the plains of the northern provinces are the favourite resort of the ostrich hunters, and the finest feathers are procured from this region. The race of "pure Forians," as Mohammed the Tunisian called them, occupy the mountainous region in the centre of the country. As far as can be judged by the meagre reports on the tribes that have been studied by travellers, they are Nigritians of a dark brown complexion, the nose flat and the forehead low and receding. They are divided into several groups, of which the most important are the Kunjara, who till recently ruled over the country, and governed Kordofân before the arrival of the Egyptians. Although considered as Nas-el-Belid, or a "stupid people," the Forians have at least this advantage, that they lack cruelty and avarice of their neighbours. Under their rule the people of Kordofân increased and prospered, whereas they have become impoverished and decreased since the departure of the Kunjaras. The Kunjara language, which after Arabic is that most generally spoken in Dar-Fôr, is said probably to belong to the Nubian group. But Lepsius has discovered that there are essential differences between the speech of the Nubas and that of the Kunjaras. The Massabat nomads, who are found in the plains between Dar- Fôr and Kordofân, are also said to be of Forian race, although they are now assimilated to the Arabs in speech. There are moreover numerous other communities, whose classification is a matter of great difficulty. All call themselves Arabs, so as to appear of more noble extraction; but the bulk of them are probably allied to the Forians. The powerful Massalit tribes, several of which live in complete inde-pendence on the western frontiers of Dar-Fôr and in Wadaï, are amongst those tribes believed to be of aboriginal descent. Till recently they were in constant feud with the Habanieh tribe, who occupy more especially the southern region of Dar-For; but peace has now been restored. According to Nachtigal, some of these people are still addicted to anthropophagy. The northern part of the country, on the verge of the desert between Kordofân and Wadaï, is peopled by Barâbra immigrants, Zogawahs, Bideyats, and many others, and even by Bisharins from Eastern Nubia. There are numerous Wadaï colonies in Dar-For which, like the other natives of the western countries, are generally known by the name of Takrur or Takarir. Dar-Fôr has also been colonised by Fulas, belonging to the same race as those of Western Africa, and by Homrs, Hamrs, or Beni-Hamrans, who possess many camels, and who claim to have come from Marocco. They live principally to the north-east of the Marrah Mountains, in the Om-Bedr oasis, and to the west in the Wadv-Bareh, where they practice sorcery; some of their families have even penetrated as far as Kordofân. According to Ensor, the Homrs are distinguished from the other inhabitants of Dar-Fôr by the respect which they show to their wives. The majority of the strangers consist of Arabs, or of "peoples assimilated to the Arabs," who have come from the north and east. Already some centuries ago, and probably even at a period anterior to the Hegira, nomads from the Arabian peninsula had penetrated into Dar-Fôr. The Tunjur or Tunzer, who governed the country and whose descendants still live in the mountains and plains situated south of El-Fasher, claim to be Arabs and are considered as such, although they are not Mohammedans, and although the peoples in these countries are usually classed according to their religion. In the opinion of Lejean can they are not Arabs, but Tubbu tribes who have migrated from the north-west. The Mussulman "Arabs" also, who roam in the plains, divided into numerous groups, are evidently of mixed origin, like those of Kordofân, whom they resemble in customs and speech. In southern Dar-Fôr all the tribes belong to the great Baggâra family. According to Mohammed the Tunisian, children born of mixed Arab and Fôr parents die at an early age, whilst those born of parents of the same race are usually of sound and vigorous constitution. Consumption is extremely rare amongst them, and this malady is almost unknown elsewhere in Dar-Fôr. The civilization of the Forians is of Mussulman origin, and the Arabs have evidently been the instructors of the nation. Literature and science, if these two terms can be used in connection with a people who have scarcely emerged from barbarism, are reduced to a study of the Koran. A few magical practices, probably of African origin, are mingled with the Arab traditions; and even during this century human sacrifices were made at the chief royal ceremonies. On the accession of every sovereign, and on other occasions, two young brothers were sacrificed with great pomp, and the king with his high functionaries feasted their flesh. Agriculture is still in a very rudimentary state, their plough consisting of kind of hoe which a man drags after him. But this occupation is, nevertheless, highly honoured. Formerly the sultan of Dar-Fôr, like the king of the Funj in Senâr, the emperor of China, and other sovereigns, was extremely proud of being the first sower in his kingdom. After the rains he went forth in great pomp accompanied by the State dignitaries and a hundred young and handsome women, and cast the seed into a prepared field, all the courtiers imitating him. Then the people sowed in their turn each in his own field, and when the harvest recompensed his toil, the faithful subject offered up his homage to the "royal farmer." Nearly all the mountain region is perfectly cultivated in terraces, and produces cereals and cotton. But according to Ensor, at most a hundredth part of arable lands on the plains has been reclaimed. Industries in Dar-Fôr are still in a very undeveloped state, except those of brickwork and pottery. But the cotton stuffs that are woven in the tents are very durable and much sought after. By the natives they are even preferred to those sold by the Dongola merchants, which are of European or American manufacture. These latter are generally used as money, but salt bricks are also employed as a means of exchange. Since the annexation of Dar-Fôr to the vast Egyptian possessions, commercial relations had become frequent with the Nile. The caravans frequently journeyed between the river and El-Fasher by the market-towns of Kordofân, or else directly towards Dabbeh, on the great bend of the river. Since 1875 the Egyptian Government has even projected a future line of railway following the natural route offered by the bed of the Wady-Melek, which is generally shunned by the caravans on account of the danger of attack from marauders. Before the Egyptian conquest, nearly all the traffic of Dar-Fôr with the rest of the world was conducted by the medium of the "great caravan," which was increased by the numerous smaller "kafilahs," setting out from the banks of the Tsad and Niger. Every year, or else every two or three years, according to the political situation and the state of the markets, the Takrur pilgrims banded themselves together in a kafilah in northern Dar-Fôr, and the merchants combined with them in order to take part at once in this pious duty and in a profitable work. The great caravan consisted occasionally of some thousands of persons and fifteen thousand camels. This moving army, which none of the pillaging steppe tribes dared to attack, did not take the direction of Khartum, or even that of the Nubian Nile. Guided by the stars, the sun, and old beaten paths, it marched from station to station in a northerly direction, attaining the Nile at Siut. Like the caravan of Kordofân, it had its particular route, wells, and oases, and hence did not run the risk of having to fight for the possession of the water gushing forth here and there in the desert. Moreover it was split up into several sections, which followed each other at a few days' interval, so as to give the water time to collect again at the bottom of the wells. Dar-Fôr is naturally divided into a central province, that of the mountainous region, from which the watercourses descend, and where the masters of the country have nearly always resided, and into the provinces of the surrounding lands, including the region of the steppes. The dâr or central region, which comprises the highlands, is known by the name of Torra; the others are termed according to their geographical situation, Dâr-Tokonavi or "the north," Dali or "the east," Uma or "the south," Dima or "the south-west," and El-Gharb or "the west." Moreover, all the well-defined geographical regions bear the name of dâr, or “country,” independently of the political administrative decisions. The present Fasher, that is to say the " Residence," is situated at a height of 2,456 feet on the eastern slope of Dar-Fôr, between two sandy hills, and on the edge of the Tendelti lakelet, which is fed by a wady descending from the northern Marrah hills. Its current, being retained by a dyke, supplies the inhabitants with water for more than half of the year; however, before the rainy season the bed of the lake has to be excavated to a depth of over 30 feet before drinking water can be procured. 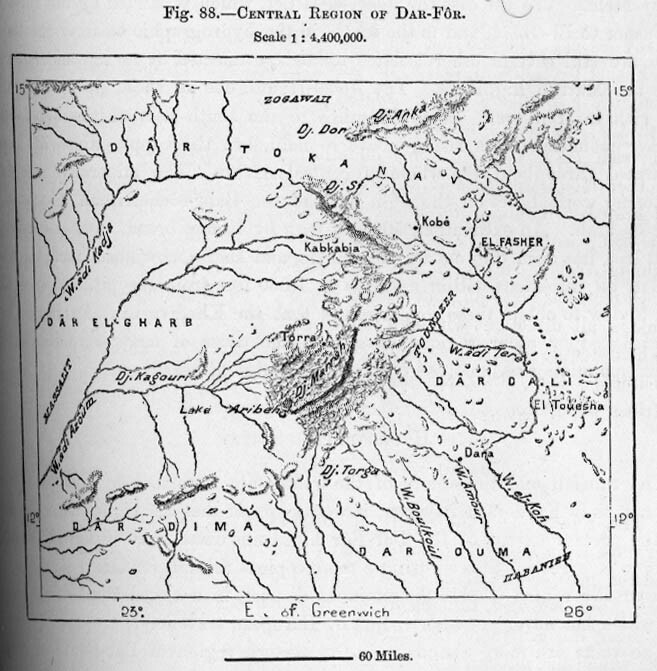 El-Fasher lies nearly midway between the capitals of Kordofân and Wadaï, on the regular caravan route. It is not the largest town in the country, being merely a group of clay huts thatched with straw, with, according to Ensor, a population in 1875 of merely 2,650 persons. The principal city, which was also the "residence" towards the end of the last century, is Kobeh, also lying on the caravan route some 30 miles to the north west. Of all the towns of Dar-Fôr, it is the only place which boasts of a few stone houses, a proof of the influence of a remote civilisation. These houses belong to the merchants or the heads of the caravans, and are surrounded by huts similar to those which are found in all other towns and villages of this country. Towards the end of last century, Brown estimated its population at 6,000 persons. Omshanga, situated nearly midway between El-Fasher and El-Obeïd, at the junction of the Shekka route, is also a large town, provided with an abundance of excellent water, which is contained in wells 130 feet deep. South-west of El-Fasher, in an upland mountain valley, the town of Tora, Torra, or Toran, which has given its name to the central province of Fôr, is also said to be regarded as a kind of capital, and here are all the royal tombs. Since the Egyptians have obtained possession of the country, new towns been founded, the most important of which is Fojeh or Foja, the arrival station the Egyptian caravans. The oasis of Om-Bedr, about 60 miles to the north, has no settled villages, although it is the centre of the Homr populations. At times over six thousand persons and fifty thousand camels assemble together on the temporary camping-ground. Dara, in the northern region of the province, till recently enjoyed some little distinction as the residence of an Egyptian mudir or governor, and as the carjru station between Dom-Suleïman and El-Obeïd. A mere group of tokuls, it lies near the left bank of the Wady-Amur, on which also stands the village of Menovachi, about 60 miles farther north. Near here in 1874 was fought decisive battle which cost King Brahim his life, and converted Dar-Fôr into Egyptian province. To the south-east the town of Shekka or Shakka, which still lies within limits of the ancient kingdom of Fôr, was the chief town of the province of Bahr-el-Ghazal, under the khedival rule. It is peopled with Jellabis or “merchants," as is also the case with a small group of villages, bearing, the name of Kobesh, but which is usually termed Kalaka, like the surrounding country. Midway between Shekka and El- Fasher, the principal caravan station is Tuesha, a second group of villages whose name is but too well known throughout the Mussulman world. It is a depôt for slaves, who are here generally made eunuchs before being forwarded to Egypt. The routes converging on Tuesha are covered with the bleaching bones of these unfortunate people, whom no one thinks it worth while to bury. In its western division, beyond the Marrah Mountains, Dar-Fôr appears to possess no groups of settled habitations deserving the name of town or village. Here it is everywhere conterminous with the powerful Mahommedan kingdom of Wadaï, with which it is connected by only one known military or caravan highway. The drainage also lies in the same direction, all the streams rising on the western slopes of the Marrah range flowing intermittently through the Batha and the Bahr-es-Salamat westwards to the basin of Lake Tsad.